Mens-Wedding-Rings (http://www.Mens-Wedding-Rings.com), the Internet retailer best known for its vast selection of top-quality affordable wedding bands, is pleased to announce that they have increased their selection of men’s designer platinum rings. Even with all the contemporary metals available today, men are still attracted to the rare brilliance of platinum, also known as the “king of all metals.” As more ring buyers get comfortable with buying jewelry and precious metals on the Internet, they are finding that Mens-Wedding-Rings.com (MWR) has the most competitive prices and the best variety of precious metals. With these new additions to their collection of men’s designer platinum rings, MWR offers customers yet another reason to consider precious metal jewelry. Since Mens-Wedding-Rings.com launched nearly two years ago, shoppers have come to rely on this retailer for the greatest variety of traditional and alterative metals. While many customers have chosen from their collections of durable industrial metals, some say that nothing compares to the luster and brilliance of platinum. In keeping with MWR’s commitment to offer a more robust selection of rings for men in every metal, style and price range; they decided it was time to add men’s designer platinum rings from one of their favorite designers. With these new additions to their collection of men’s designer platinum rings, MWR offers customers yet another reason to consider precious metal jewelry. In addition to their spectacular designer collections in Argentium silver, gold, diamond and seranite, MWR is a destination for shoppers who want men’s designer platinum rings. As gold prices continue to rise, the difference in price between gold and platinum is not as much as it used to be. Platinum is a rare metal known for its unique radiance – especially in its purest form. It will never need re-plating and it is extremely durable. Their designers only sell rings made from the purest jewelry grade of platinum, which is evident by the hallmark inscribed on the inside of every ring. According to Federal regulations, all platinum rings must bear a hallmark, or stamp, on the inside of the band, indicating the ring’s authenticity and level of purity. 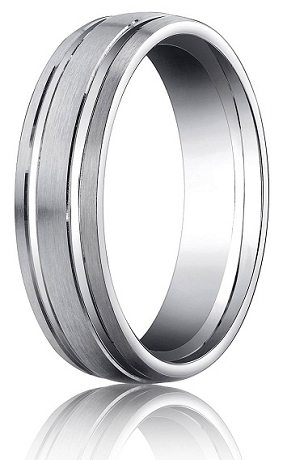 A high quality men’s platinum ring will be an alloy of 95% pure platinum, along with cobalt or ruthenium. Other retailers have attempted to sell platinum rings that are only 80 percent platinum, but not MWR. The men’s designer platinum rings on sale here are all 95 percent pure. MWR always advises their customers to check the purity content of any ring they buy because all precious metals must be alloyed with other metals to achieve the right level of hardness for jewelry. At Mens-Wedding-Rings.com, shoppers have no problem finding the perfect platinum ring because they can browse by price range, metal, designer, and ring size. This eliminates the need to scroll through pages and pages of rings to find one that meets their needs. As more men begin to shop the collections of men’s designer platinum rings at MWR, this retailer is often asked for advice on choosing a ring. One of the newest men’s wedding bands in the Benchmark platinum collection that they often recommend is a 6mm flat-profile ring from Benchmark with a single round-cut diamond set into the bezel. 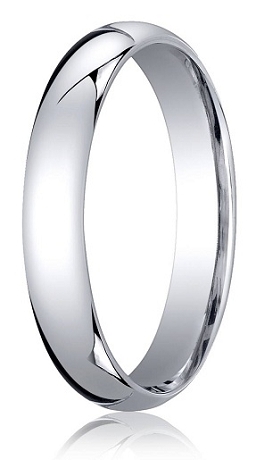 With a satin finish and polished beveled edges, this exquisite platinum wedding band makes a sophisticated statement. 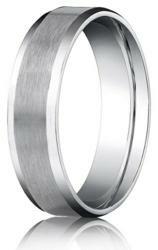 It is just one of many men’s designer platinum rings available at Mens-Wedding-Rings.com. Even as the popularity of newer metals rises and falls, MWR has seen consistent interest in men’s platinum wedding rings. They have also noted that most men who purchase a platinum ring will choose a less decorative style because it allows the beauty of the metal to stand out. But this doesn’t mean the ring cannot be stylish; the expanded selection of men’s designer platinum rings at MWR allows shoppers to find the perfect platinum wedding band to match their personal taste. Mens-Wedding-Rings.com is a niche online jewelry store for men's wedding rings and bands. In this specialized retail environment, customers find the best quality men’s traditional and alternative wedding rings. From major designer bands in traditional and alternative metals to non-designer rings in stainless steel, titanium, tungsten, sterling silver and cobalt, Mens-Wedding-Rings.com is a one-stop source for men’s wedding bands and rings. Owners Roy and Judy Devine make it their goal to ensure their customers are completely satisfied, so they only sell high quality rings at excellent prices. All of their rings come with a 100% satisfaction guarantee, and their customers have come to expect the highest standards of service, selection and quality when they shop at Mens-Wedding-Rings.com. MWR offers the best selection of men’s wedding rings on the Internet, many of which are available through size 20.